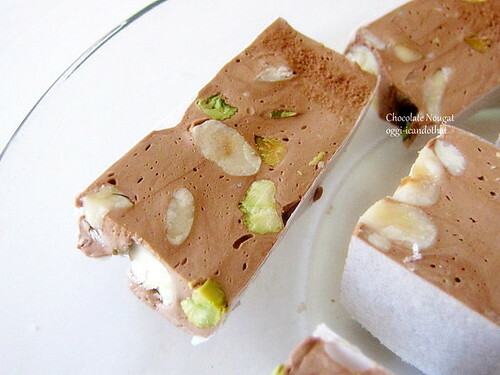 Chocolate Nougat ~ I Can Do That! I've been busy studying reading the most comprehensive and engrossing non-fiction book I have ever owned, ADVANCED BREAD AND PASTRY by Michel Suas. I kid you not, browsing through the book feels like I'm a student reading a textbook and preparing for an exam because it's meant to teach. The book is divided into 4 categories and 22 chapters, 942 pages in all with additional 87 pages for conversions, baker's percentages, temperature conversions, glossary, references, formula index, and subject index. Part 1: Introduction, 43 pages, a chapter on historical perspective and current opportunities on bread and pastry and a second chapter on food safety and sanitation in the bakery, which are all must-read. At the start of each chapter are objectives and brief introduction or history and at the end of every chapter a summary, key terms, and review questions. define the classical categories of petit fours and the characteristics of the items. describe the contemporary categories of petit fours and to be able to make a selection of them. define the properties of saturated and super saturated sugar solutions and to be able to make them successfully. make a selection of sugar confections including crystalline, noncrystalline, aerated, and jelly. While I'm not a newcomer to candy making, I'm not an expert either and this book will probably make me one after I am finished reading it and if/when I'm done making all of the formulas which might take forever. The first I made from Part 4 Chapter 18 is Chocolate Nougat because I've never had chocolate nougat before. The chocolate in the recipe is called chocolate liquor which should not to be confused with chocolate liqueur. The glossary section defines it as "the product of the whole cocoa bean after it has gone through the initial production process and can be turned into cocoa powder and cocoa butter, can be sold as unsweetened chocolate, or can be further processed into dark or milk chocolate". Glucose is available at candy/cake supply shops or you can get Wilton's but this brand is 3x more expensive. I used Ghirardelli 100% Cacao Unsweetened Baking bar. The candies came out perfect, not too hard nor too soft, have the right amount of sweetness and crunch from the nuts, and the chocolate flavor is rich without being overpowering. I love it! Line the bottom of an 8 x 11-inch pan (or metal frame if you have one) with a sheet of rice paper. Toast the hazelnuts and almonds in a 275°F oven until golden. Turn heat down to warm (100°F), add pistachios and keep them in the oven until needed. In a medium heavy bottomed stainless steel pan, cook the first sugar, glucose, and water to 302°F. When the sugar mixture reaches 248°F, start cooking the honey (in a small stainless steel pan). Cook the honey to 266°F. Using the whisk attachment, whip the egg whites with the ¾ ounce sugar. Slowly pour the honey onto the whipping egg white. 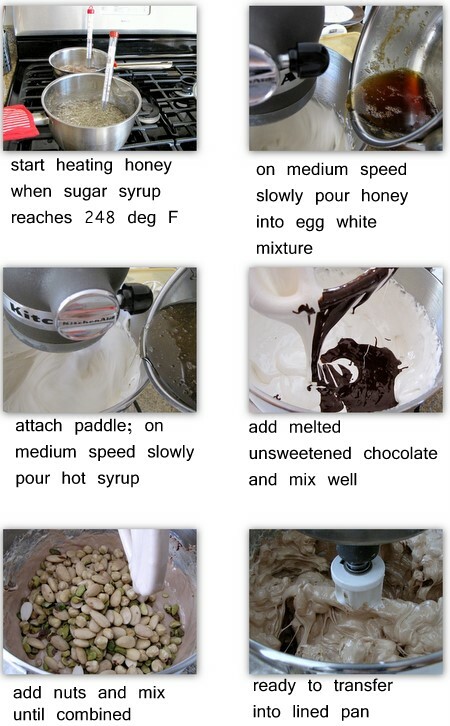 Switch to the paddle attachment and add the hot sugar syrup. When full volume is reached, add the melted chocolate and mix until blended. Add the warm nuts and mix until incorporated. Transfer into the lined pan and smooth out if necessary with a buttered rubber scraper. Press the second paper on top of the nougat. Leave on the kitchen counter to set. 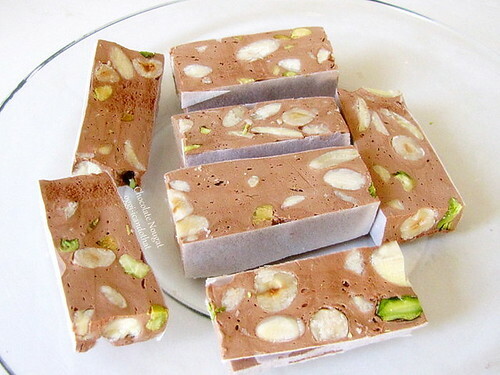 When nougat has cooled, cut into desired sizes. I am sure many chefs in renowned restaurants can't cook as well as you do. You never fails to amaze me. That looks great. Are you liking this book? Hi there, I realize this is an old thread and I hope you get this post. Do the cooked and whipped egg whites collapse when the chocolate is added?